In the latest Metal Gear Solid V: The Phantom Pain patch, a highly desired change has been made involving one of your buddies in the game. If you haven’t finished the game through to Mission 45, I highly suggest you do that before continuing. This will spoil a major plot point in the game. Eventually in the late game, if you have Quiet and meet certain conditions, she will suddenly leave and you are given a Side Op to locate her. Upon completing said Side Op, you are locked into Mission 45, and unable to exit out of it. Why? Because upon its completion, Quiet leaves your team permanently. There’s no turning back. I remember when this happened to me, and I had no warning and no way of getting her back. That sucked, because she’s really useful. I’m not the only one who was disappointed, as many threads in the r/metalgearsolid subreddit and elsewhere had plenty of others also upset by this realization. While a powerful narrative moment, it was a questionable-at-best design idea (I unlocked costumes for her after losing her. Welp, that’ll be useful, right?). Some even modded the PC version to bring her back after the fact. 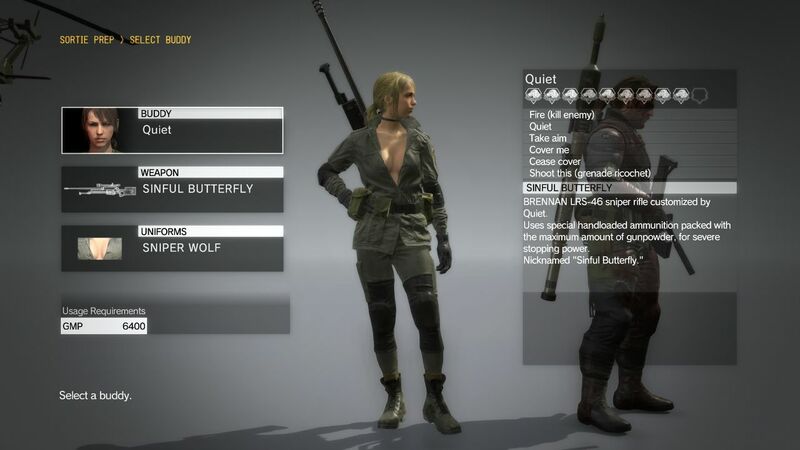 Well, as reported by user Brotigan on Reddit, you can now seemingly re-recruit Quiet with the latest patch in place. All you need to do is replay Mission 11: Cloaked in Silence 7 times, in which its prefix name will change from “[REPLAY]” to “[REUNION],” and Quiet will once again be available for deployment. Go live out all of your cosplayed-espionage fantasies now, you can bet I will. You can read our Metal Gear Solid V: The Phantom Pain review here, as well as my thoughts on the “true” ending here.